As most people know, Valentine’s Day in Henderson, Nevada is right around the corner. If you are like us, then you are probably a little panicked about what to do and about making plans for Valentine’s Day. The good news is Borracha is here to help with some great Valentine’s Day traditions that will help get you in the mood and help you get ready for Valentine’s Day. Here at Borracha, we have our own Valentine’s Day traditions, and our own approach to celebrating this holiday of love. We know that while some people may think Valentine’s Day is all about the candy and chocolates—that’s not what most of us love. Most of us love two things—tacos and tequila. If you have ever been to Borracha before, you know that we love our tequila and we take our tacos very seriously. Our street tacos are some of the best in Henderson and are so delicious you have to try them to believe them. Of course, like any good Mexican Cantina, we also take our tequila very seriously and not only have a huge selection of different quality tequilas, but some of the most delicious house margaritas in the city. 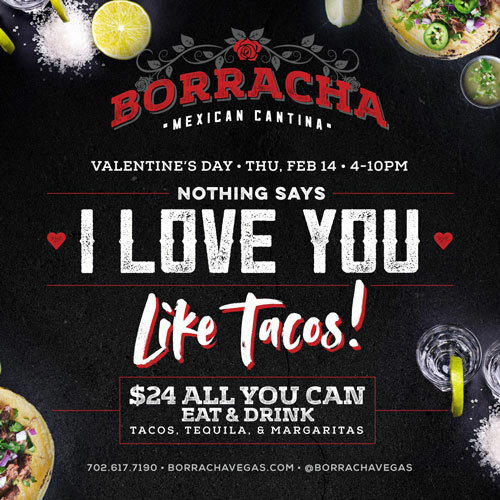 There is nothing quite like a delicious, cheesy taco and a nice cold margarita, which is why here at Borracha, this is exactly what you will find at our Valentine’s Day event. Here at Borracha on Valentine’s Day, we will be having a $24 All You Can Eat (and drink) event. For just $24 you can enjoy all you can eat tacos and all you can drink tequila and margaritas. This is one way to bring you and date (or a friend) for a Valentine’s Day you will actually enjoy. No overpriced dessert menus, no stuffy restaurants and no cheesy gimmicks—just the food and drinks you love at a great price. This is the perfect event for you and your special someone, or you and all of your friends—so no matter who you choose to spend valentine’s Day with, you can rest assured that you are at least getting to enjoy what you love. So, come down to Borracha on Valentine’s Day, February 14thto celebrate our All You Can Eat and Drink special. There is no better way to come and celebrate this holiday with things that you actually love and enjoy. Our special runs all evening long and is one event you aren’t going to want to miss. After all, nothing says “I love you” like tacos and tequila.